Art House is made up of 4 individual and self contained mini apartments within a large villa and are sized from studio to 2 bedrooms. (Two or more spcaces can be combined for larger group sizes). Each apartment has its own private bathroom, some have outside spaces/terraces of their own but they also all share a common terrace garden on the ground floor (though this is only open to guests in July and August when owners are not there). 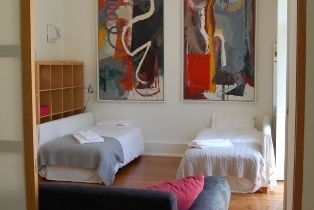 In addition all guests have use of the communal living room and dining room areas during the months of July and August. Some units are equipped with a small kitchen whilst others offer a smaller area which includes tea making facilities and fridge and microwave oven. For more information please email us otherwise find them listed separately by using the links below. Tempo da Música is a studio which has a small tea/coffee making facility. No cooking other than in a microwave would be possible and it has no living room (being a studio) so it would share the communal living room in the two summer months but otherwise would equate to a large hotel room size. Lugares da Memória has a bedroom and a small living room of its own (and you may still use the communal one in Jul&Aug). It offers a small kitchenette with a hotplate and microwave and sink for washing up. It has a small outside courtyard but it is not really adequate for eating out on, more for enjoying a little sun with a book on a deck chair. Note: The above two apartments can very comfortably be combined (as they are opposite each other in the same corridor) to make a nice 2 bedroom apartment with two bathrooms and a small private living area & kitchenette. You may also use the communal living and dining area in July & August where complimentary coffee & tea is offered by the owner. Silencios is a two bedroom apartment with a small kitchenette and but no living room. However the second bedroom contains a sofa bed so can be used for sitting if you don’t require a second bedroom. It has a kitchenette with washing up facility and of course each unit does have its own private bathroom. Aquamadre has a bedroom area (closed off by a rice screen sliding door) and it has a sitting room area containing two single beds, which can be used as a second sleeping area if needed. Again with private bathroom and a basic cooking facility. It does have tea coffee making facility. It’s got a wonderful private veranda overlooking the square, making it our favourite. When combining two spaces it may be useful to know that Aquamadre and Silencios are on the first floor of the house and Lugares da Memoria and Tempo da Musica are on the ground floor. This is an introduction to the basic principles of ATV riding. Practised on an all terrain circuit and aimed at those who wish to get started... the motto is “learning in safety” – Fun for everyone!